I’d say my sleepovers of the past were equally awesome. Although we were inexplicably obsessed with The Monkees (even then we knew they weren’t real musicians, we just didn’t care) so we’d watch them all night then karaoke to their songs all the next day. @Jen – you must be in my generation! It was Monkees, Osmonds, Bobby Sherman and the Partridge Family – yowza! And we did that dumb thing with bras in freezers and truth or dare games. Damn, I miss being a kid! Totally my generation. I was obsessed with them all. I took one entire room in my bedroom and floor to ceiling was covered with pictures of these guys along with Paul Revere and the Raiders. Remember them? I thought my Mom would die when she saw it. Those were fun days. Again, loving your column. 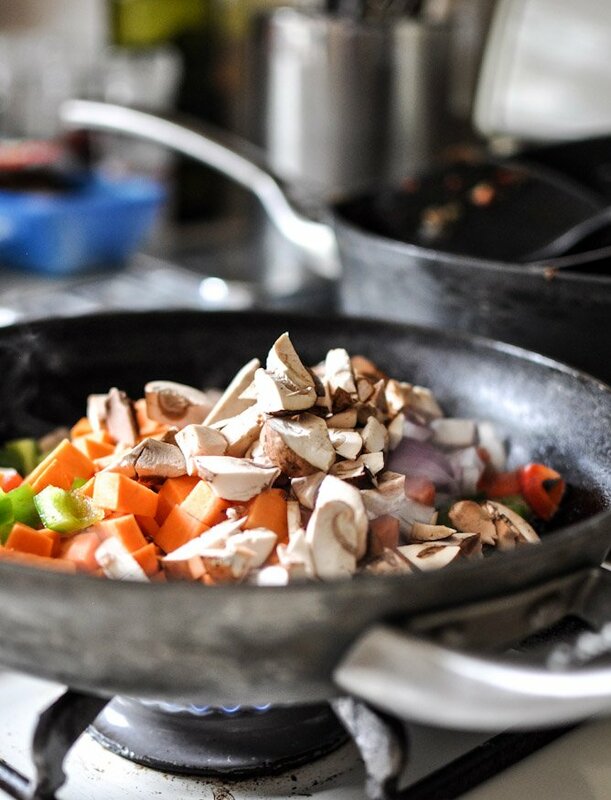 Thanks for the memories, recipes, and fun. You will most definitely become my favorite go to column for a bit of laughter, and of course, great recipes. Oh, I loved sleepovers in middle school! 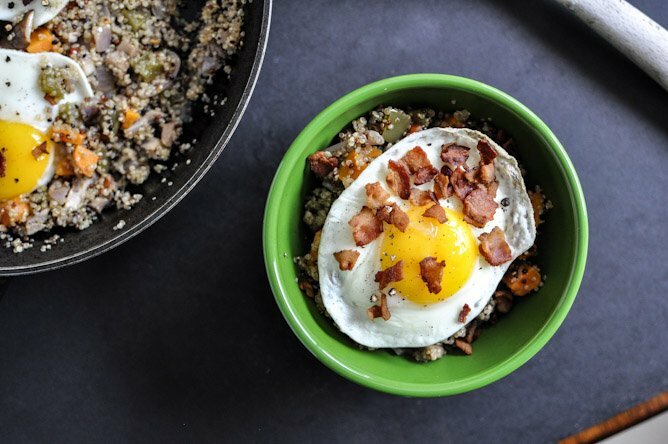 We would always watch scary movies and giggle about boys :) This breakfast quinoa would totally be my dinner, because I don’t like eggs for breakfast. I know, I’m strange. Your sleepovers sound a lot like mine! I absolutely know what Snick is!! I used to watch that all the time, as well as 90210! 90210 is still one of my very favorite, if not my very favorite, tv shows! I love it when they play marathons on SoapNet!! I have seen every episode a gazillion times! I know some episodes word for word. Is that sad?? In 7th grade, I was in love with my set of mini hand sanitizer bottles from Bath & Body Works — each with a different scent, of course, for maximum joy. One little splurt and the whole classroom smells like cucumber melon! Those were the days. Wow. Talk about a breakfast that will stick to your ribs. This looks amazing! I’m so glad you call them dippy eggs! I’ve never heard anyone outside of my family call them that! YUM! I love quinoa so I must make this soon! This looks really good. I wake up early, so breakfast anytime is good! I love the new layout design you have. Seriously!!!.. How did you get your eggs to look so perfect!! !… Must TELL!!. 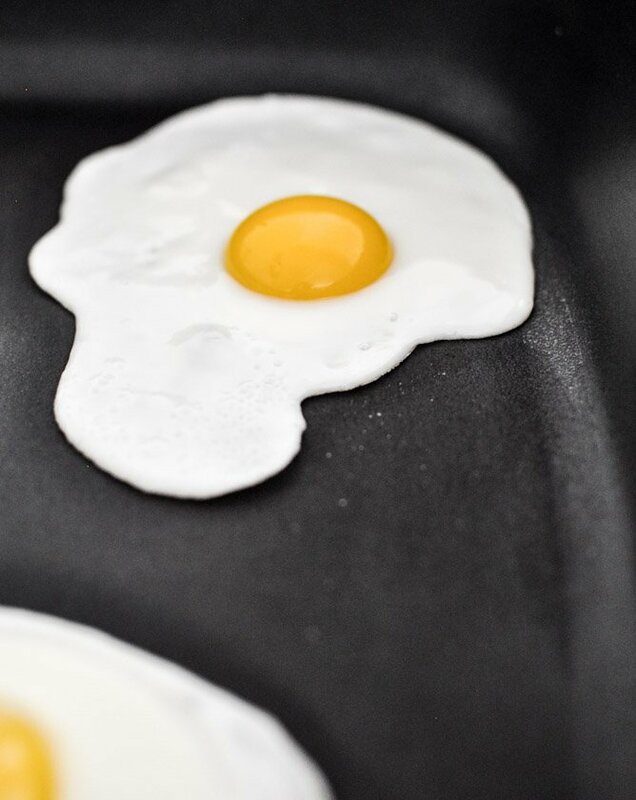 I cannot for the life of me cook a egg like that. Please share. thank you. I love your blogg., it’s the sugar in my coffee every morning. :). 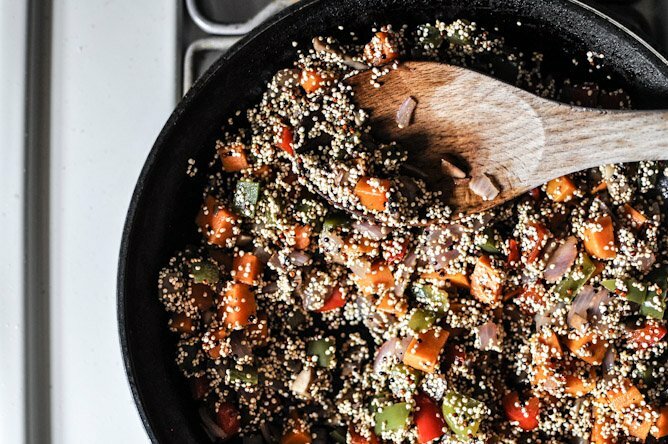 This looks insanely hearty, and the things you do with quinoa make me happy. That is all. Why do my eggs never look like this??!!! Amazing! Jessica, how about trying to poach the eggs by cushioning them in mounds of the hash, cover with a lid and let the steam do it’s thing? I’ll try it and let you know if it works. Love it! I just love the new look!! You have no idea how happy this post makes me. I am constantly reading pieces of your blog to my huband and can hardly get through it without cracking up – and he just looks at me like I’m ridiculous. I say, “Doesn’t she sound just like me? You don’t think she’s hilarious?! How are you NOT LAUGHING? !” And he just continues to look at me like I’m loony. I missed Tuesday. Got a double dose tonight. Thanks for making my Friday better. PS: In a totally non-creepy way – I’ll sleepover at your place any day. 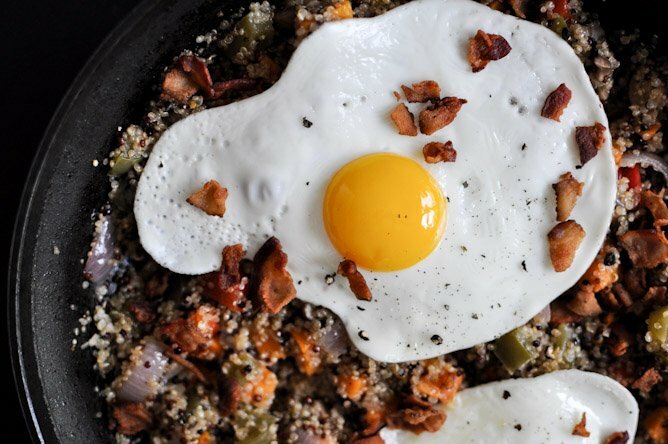 I’ve been loving a sweet quinoa porridge for breakfast, but a savory quinoa breakfast? Yes, please! This looks awesome! I love reading all of your posts…but this one totally hit home for me. Snick and sleepovers…wow…blast from the past. Sounds like my childhood. But…the thing that got me most from this….the reason that I had to comment….Until now, I have never met anyone outside my immediate family that used the terminology, “dippy egg.” You have totally made my night…I can’t wait to call my sister. Thanks for writing! 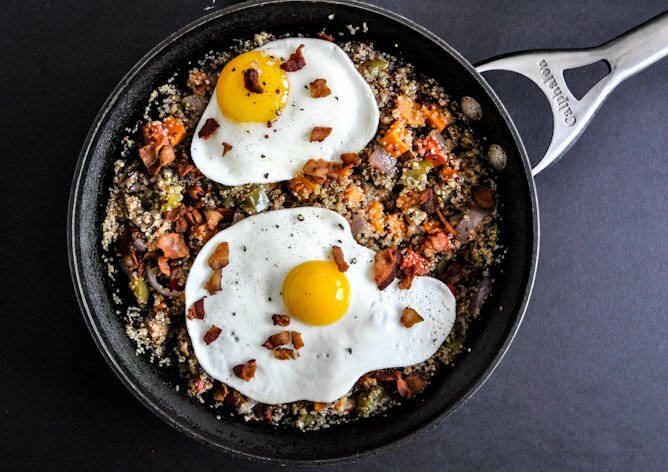 Pingback: In Season: Quinoa Breakfast Skillet « WHAT DRESS CODE? 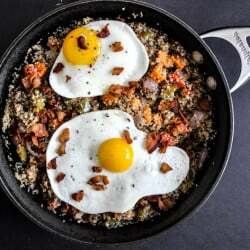 Pingback: Recipe: Quinoa Breakfast Skillet | What Dress Code? What a nice change for breakfast. This is on my breakfast menu in the future for sure! Thank you for this recipe! This was the best breakfast (lunch and dinner) I’ve cooked in a while. I drizzled Sriracha on the finished product and though it added a great extra-kick! I loved this! However, I think next time, I’ll cook the quinoa ahead of time, and add it to the veggies. I also added asparagus to my veg mix, and garnished with the bacon and sliced avocado. YUM!